This is a article about how to get IBM HS 22 Blade and IBM BladeCenter GPU Expansion Blade to work with XenServer 6.0 Multi-GPU Passthrough and XenDesktop 5.6 HDX 3D Pro. After receiving our brand new IBM HS 22 Blade with the GPU expansion bay, we plugged it in and put it into our BladeCenter. So, next step was to install XenServer 6 to get the GPU Passthrough features up and running.This is where all the problems started, as we did not get neither XenServer 6.0 nor a plain physical installed Windows Server 2008 R2 to talk 100% with the GPU. In our case this GPU expansion blade, has a Tesla M2070-Q card onboard. Now, after talking to IBM(they actually took the blade with them to their HQ here in Norway), we did not find any problems with neither with the HS22 itself nor with the GPU expansion blade. So, we got it back from IBM without any luck. During this whole time Citrix Support had given us excellent support! Just needed to say that, because it’s true! Its the same, I guess the card may have been working with XenApp and application publish… if the apps are using OpenGL etc… with just HDX 3D, but not with directly connecting with it, which is what we want when we are talking about Citrix HDX 3D Pro. So, Ndivia gave us a firmware patch. The problem with this patch is that its HW depended. This new GPU BIOS flash did the trick! 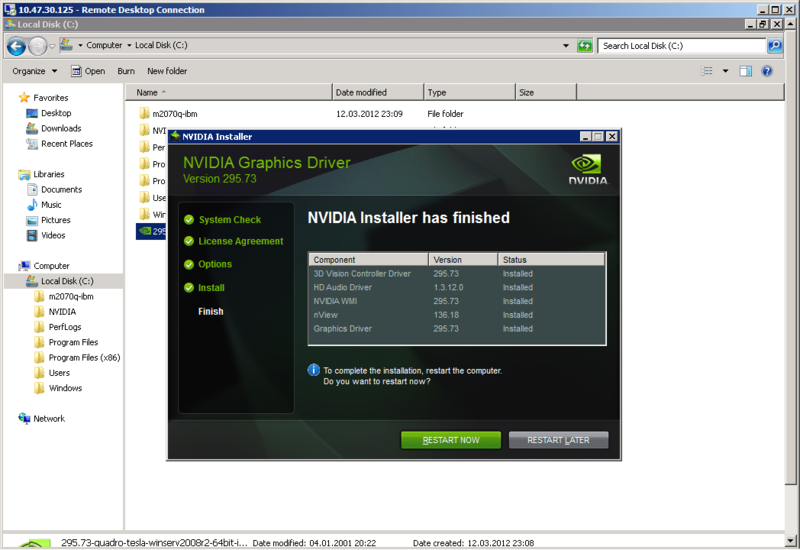 As you can se from my screen dumps, we simply first installed the latest NVIDIA Tesla Gaphics Driver and rebooted. After that we used the m2070q-ibm-vga.exe file to flash our GPU card. 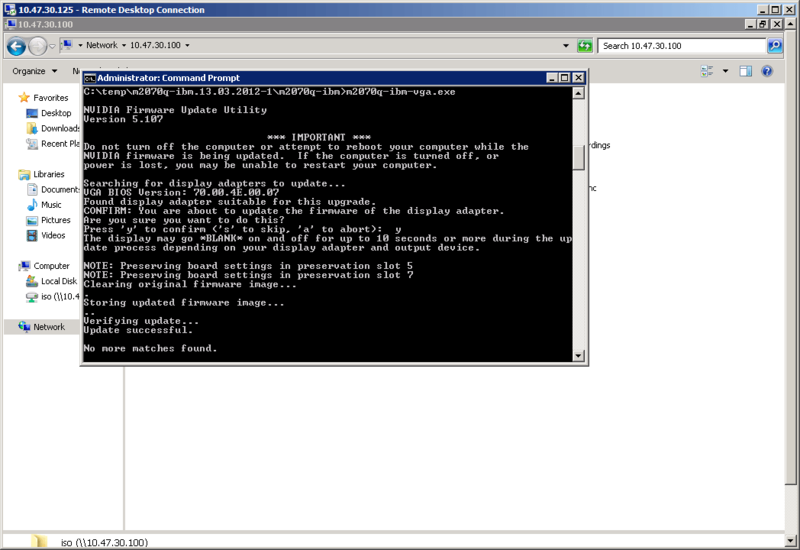 Have in mind that I actually did all this via a normal installed Windows Server 2008 R2, not via a Virtual Machine(VM), but it might work with XenServer 6. After you install NVIDIA drivers you should have nvidia-smi utility, possibly in C:\Program Files\NVIDIA Corporation\NVSMI\, this tool allows you switch card’s mode. Now, after contacting Nvidia Support you should have 3 files from them. 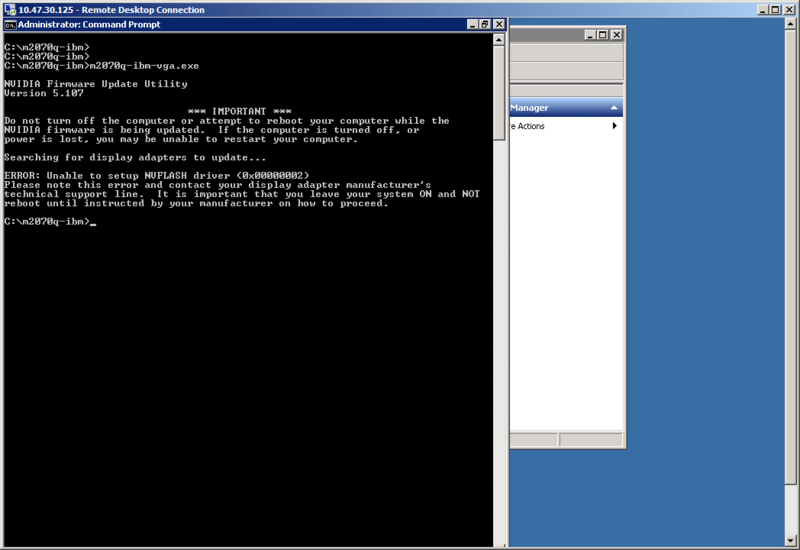 Depending on what you want to do, and I guess you want to make this work, you should run the m2070q-ibm-vga.exe file. If you get the error messages you see above you need to contact Nvidia again, I wanted to put it in here so you can see what you don’t want to have! Now, running it again with the right firmware flash for our Tesla M2070-q card from IBM, it now searches for the card, and flashes it into the correct operating mode.